The Samuel P. Ely was wrecked in 1896 against the west breakwater in Agate Bay, Two Harbors, Minnesota. The Ely had encountered heavy head winds and high seas as it was being towed by the steamer Hesper from Duluth. The Hesper was having trouble navigating into Two Harbors, it released the Ely's towline, leaving the Ely to drag anchor and drift rapidly. The Ely landed hard on the breakwater, were it sank. The crew climbed into the rigging and waited to be rescued. No lives were lost. The Samuel P. Ely remains were listed on the National Register of Historic Places in 1992. It was a three-masted topsail schooner with a single-deck, 200 feet in length, 31-foot beam, and 13-foot depth of hold. U.S. Registry 23780, it was rated at 627.24 gross tons. 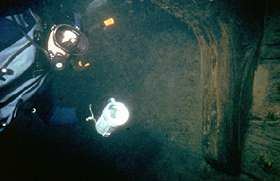 This wreck is historically significant for its association with Two Harbors and the Minnesota's iron-ore trade, and its exceptional structural integrity. The Ely was constructed at the J.P. Clark Shipyard in Springwell, Michigan in 1869. No engineering or building plans are known to exist. But it was a typical style for most Great Lakes sailing craft built from 1860 and 1870's. It was probably built specifically for the shipment of iron ore. The Ely was built with extra bracing and powerful framing members, heavy knees and hold beams, which would be needed to support the iron ore cargo. At eleven o'clock on the morning on October 29, 1896 the steamer Hesper left Duluth with a load of wheat and two empty barges in tow as it headed for Two Harbors. The barges were the Samuel P. Ely and the Negaunee, both awaiting loads of iron ore in Two Harbors. Encountering heavy head winds and high seas, the three vessels reached Two Harbors about six hours later than expected. The boats experienced a difficult time trying to enter the harbor. The Hesper let loose the towlines on the Ely and Negaunee and steamed safely in. The tug had not reached the Ely's towline quickly enough and the Ely drifted helplessly dragging it's anchors. By midnight, the Ely was hard on the breakwater and in danger of going to pieces. A tug tried to pull it off and ended up on the breakwater itself, its crew of two took refuge on the Ely. The schooner sank against the breakwater at three o'clock in the morning, the men climbed to the rigging to prevent drowning. High seas and terrible winds soaked the crew, but all survived till morning. The tug Ella G. rescued the 10 men by drifting a small sailboat on 200 feet of line and dragging them back to the tug. The S.P. Ely is located on the west breakwater in Two Harbors, MN, which is about 20 miles up Highway 61 from Duluth. Since the breakwater is not connected to the shore, you will need a boat cross the harbor from the boat launch to the site. The stern of the Ely is embedded in the breakwater and the wreck lies at about a 20 to 30 degree angle to the wall in about 30 to 35 feet of water. The bow points to the west. Most divers tie-up their boat at the far end of the concrete break wall where there are no steel pilings. If you enter the water at that point and swim toward the east end of the break wall to the first or second curved piling structure, then swim away from the wall at one of those points you should run into the wreck. When the water is clear you can even see the top of the centerboard trunk from the surface. 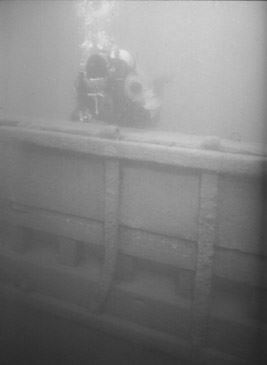 Hopefully yet this year there should also be a mooring block and buoy marking the wreck site, which will make diving the S.P. Ely even safer and easier. The mooring will also minimize anchor damage to the wreck from boaters that choose to anchor on the wreck instead of tying to the wall. Sport divers have been diving on the Ely since the 1950's. Although many artifacts have been removed over the years, there is still much to still look at. The wreck lies in 15 to 35 feet of water and the visibility ranges from 2-10 feet depending of the wind direction and the amount of vessel traffic into the harbor. Divers should be aware of the silt layer which covers the wreck as it is easily stirred up by incoming vessels and divers. The Ely was wood framed and built out of white oak. Much of the structure is still intact, allowing sport divers to get a feel for what a schooner-barge looked like in the 1890's. The damage to the stern occurred during the 1896 accident which caused the vessel's loss, increase damage incurred when the breakwater was repaired and added to. The bow damage possibly occurred over the years from anchoring commercial vessels and working harbor maintenance crafts. 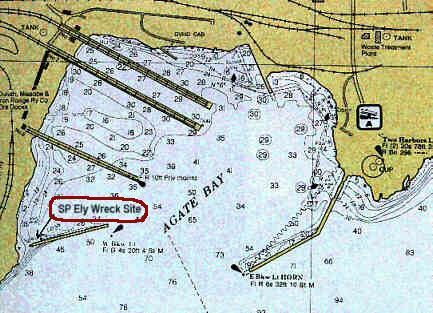 The 1994 Ely project is, of course, the project that basically forged the original core group that founded the Great Lakes Shipwreck Preservation Society. In the early '90s, the Corps of Engineers added the curved pilings to the breakwater and in doing so dropped several large boulders on the stern deck of the Ely. To keep the deck from collapsing, they sawed across the deck separating the aft twenty-five feet of deck from the rest of the deck. This action weakened the fragile wreck and caused the starboard side to lean even more noticeably to the outside. This, in turn, caused the forward twenty feet of deck to collapse. We knew within five years the Ely would be another flat wooden wreck site. In 1994, we installed the original steel rods that now keep the sides together and vertical. Two of these rods were replaced with heavier rods in 1999. Now our goal is to repair the damage that the boulders caused to the stern portion of the deck and the hatch coaming, much of which has been pushed down or collapsed into the hold. Our monitoring and maintenance of the site continues and is needed to keep the ship intact. The Ely is not only a popular dive site, but it is also on the National Register of Historic Places and is Minnesota's only example of these historic 19th Century Great Lakes schooners. The GLSPS has an S.P. Ely Stabilization & Monitoring Program.